The physiology and pathology of the human body is affected by the mountain climate. The human body is sensitive to weather change and differing climates. Analysis of mountain weather and how it is affected by mountain terrain shows that weather changes are subject to patterns but are less obvious in mountainous terrain than other areas. Conditions greatly change with altitude, latitude, and exposure to atmospheric winds and air masses. Mountain weather can be extremely erratic; within a short time or minor shift in locality, the wind may vary from stormy to calm, and from extreme cold to warmth. The severity and variance of the weather causes it to have a major impact on military operations. Mountain weather can be either a dangerous obstacle to operations or a valuable aid, depending on how well it is understood and to what extent advantage is taken of its peculiar characteristics. • The success or failure of a mission is often determined by the weather. When planning airmobile and airborne operations, military plans must be flexible. You must anticipate the weather as part of your planning in order to turn an important weather factor in your favor. The clouds that often cover the tops of mountains and the fogs that cover valleys are an excellent means of concealing movements that are normally made during darkness or in smoke. Limited visibility can be used as a combat multiplier. • The safety or danger of almost all high mountain regions depends on the weather, especially in winter. A change of a few degrees in temperature above or below the freezing point may affect the ease and speed of travel. Terrain that can be crossed swiftly and safely one day may become impassable or highly dangerous the next due to snowfall, rainfall, or a rise in temperature. The reverse can happen just as quickly. The prevalence of avalanches depends on terrain, snow conditions, and weather factors. • Some mountains, such as those found in desert regions, are dry and barren with temperatures ranging from extreme heat in the summer to extreme cold in the winter. In tropical regions, mountains are often covered by lush jungles with heavy seasonal rains and little temperature variations. High rocky crags with glaciated peaks can be found in mountain ranges at most latitudes along the western portion of the Americas and Asia. 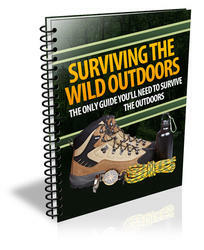 • Severe weather may decrease morale and increase basic survival problems. These problems can be minimized when you have been trained to accept the weather by being self-sufficient. As a mountain soldier, properly equipped and trained, you can use the weather to your advantage in combat operations. Mountain air is relatively pure. The higher the elevation, the more pure it becomes. Above 4,500 meters, air is almost germ-free. The composition of the air of high altitudes is different than air at sea level. Falling snow also purifies the air by capturing and holding many of the impurities in the air. • Pressure is low in mountainous areas due to the altitude. The barometer usually drops 2.5 centimeters (1 inch) for every 300 meters gained in elevation. This equates to a 3 percent drop in pressure for an increase of 300 meters in elevation. This decreased pressure causes the air to expand, decreasing the amount of oxygen and moisture in a given volume. Consequently, oxygen decreases with elevation. • High mountain air is dry and may be drier in the winter. Due to this increased dryness, equipment does not rust as quickly and organic material decomposes slowly. The dry air also requires you to increase consumption of water. The reduced water vapor in the air causes an increase in evaporation of moisture from the skin and in loss of water through transpiration in the respiratory system. Due to the cold, you do not naturally consume the quantity of fluids that you would at higher temperatures, hence you are encouraged to consciously increase your fluid intake. • The air is thinner as atmospheric pressure drops with the increasing altitude. At higher altitudes, the thinner, drier air has a reduced molecular content and, consequently, a reduced filtering effect on the sun's rays. Both visible and ultraviolet ray intensities are greater with increased altitude. These conditions increase the chance of sunburn, especially when combined with a snow cover that reflects the rays upward. • Hurricane winds and gentle breezes may occur within two to three kilometers of each other. • Weather in exposed areas contrasts sharply with the weather in sheltered areas. • Weather changes in one day can be so variable that in the same locality there may be hot sun and cool shade, high winds and calm, gusts of rain or snow, and then intense sunlight again. • Distortion of storm movements and the normal winds by irregular mountain topography. 5. Temperature. For air moving up a mountain with condensation occurring (clouds, fog, and precipitation), the temperature of the air drops 3.5 degrees F with every 300-meter rise in altitude. For air moving up a mountain with no clouds forming, the temperature of the air drops 5.5 degrees F for every 300-meter rise in altitude. Mountain temperatures may be affected by temperature inversions, solar heating, and weather patterns. • Temperature inversions occur when mountain air is cooled by ice, snow, and heat loss through thermal radiation. This cooler, denser air settles into the valleys and low areas. During a troop movement or climb started in a valley, higher temperatures may often be encountered as altitude is gained. This reversal of the normal cooling with elevation is called temperature inversion. The inversion continues until the sun warms the surface of the earth or a moderate wind causes a mixing of the warm and cold layers. These inversions are common in the mountainous regions of the arctic, subarctic, and mid-latitudes. • At high altitude, solar heating is responsible for the greatest temperature contrasts. More sunshine and solar heat are received above the clouds than below. The important effect of altitude is that the sun's rays pass through less of the atmosphere and more direct heat is received than at lower levels, where solar radiation is reflected and absorbed by dust and water vapor. There may be differences from 40 to 50 degrees F between surface temperatures in the shade and surface temperatures in the sun. This is particularly true for dark metallic objects. The difference in temperature felt on the skin between the sun and shade is normally 7 degrees F. You must exercise special care to avoid sunburn and snow blindness. Snow blindness results from the combination of intense sunlight and ultraviolet rays reflected from snowfields or clouds. At high altitudes, the temperature rises fast after sunrise and drops quickly after sunset. Much of the chilled air drains downward, due to convection currents, so that the differences between day and night temperatures are greater in valleys than on slopes. • The heating and cooling of the air affects planning considerations, mainly the clothing and equipment needed for an operation. Local weather patterns force air currents up and over mountain tops. Air is cooled on the windward side of the mountain as it gains altitude, but more slowly (3.5 degrees F per 300 meters) if clouds are forming due to heat release when water vapor becomes liquid. On the leeward side of the mountain, this heat gained from the condensation on the windward side is added to the normal heating that occurs as the air descends and air pressure increases. Therefore, air and winds on the leeward slope are considerably warmer than that on the windward slope, which is referred to as chinook winds. Clouds are indicators of weather conditions. Proper reading of cloud shapes and patterns provide weather forecasters with little need for additional equipment such as a barometer, wind meter, and thermometer. Clouds are classified by shape and height. • Shape provides information about the stability of the atmosphere and chance for precipitation. • Height (above ground level) provides an indication of the distance of a traveling storm and the chance for precipitation. 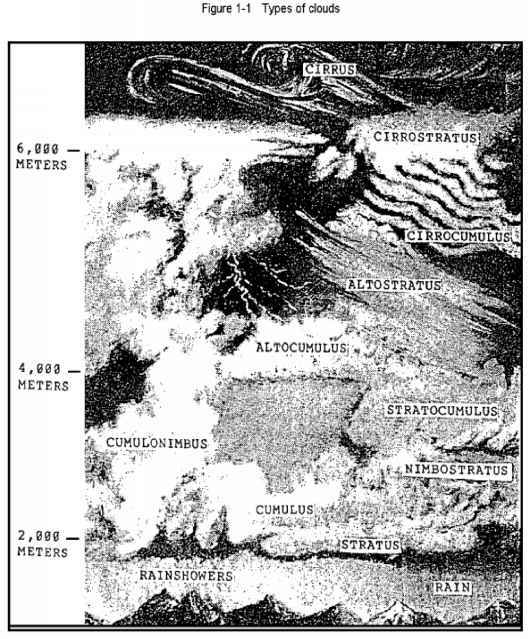 Figure 1-1 shows the types and estimated heights of clouds, heights may vary based on geographical locations. The two major types of clouds, as classified by shape, are cumulus and stratus. • Cumulus clouds are so-called "puffy" clouds, they resemble tufts of cotton. Their form from bottom to top is often equal to or greater than its width. They have sharp, distinct edges, because they are composed of water droplets. Air temperatures within the cloud is warmer than -30 degrees. These clouds are usually indicators of instability at the altitude where they are found, and stormy weather associated with these clouds is usually violent with heavy rain or snow and strong gusty winds. A precipitating cumulus cloud is called a cumulonimbus cloud. • Stratus clouds are layered and appear flat, expanding more in the horizontal plane than the vertical. They are indicators of a stable atmosphere, but may indicate the approach of a storm. Stormy weather associated with these clouds does not include violent winds, and precipitation is usually light but steady lasting for up to 36 hours. Lightning is very rare, but sleet and fogs are also associated with these clouds. A precipitating stratus cloud is called nimbostratus. If a cloud cannot be determined cumulus or stratus, it may be evolving from one type to another, indicating a change in atmospheric stability. This is called a stratocumulus cloud. Clouds are classified into three height (above ground level) categories, and they are low, middle, and high. • Low Clouds. These clouds are below 2,000 meters, and are either cumulus or stratus, or their precipitating counterparts--nimbostratus or cumulonimbus. Most precipitation originates from low clouds because rain or snow usually evaporates before reaching the ground from higher clouds. These clouds are indicators of impending precipitation, especially if the clouds appear dark at their bases, which indicates that they are more than 1,000 meters thick. • Middle clouds. These clouds are positioned between 2,000 and 6,100 meters. They have a prefix of alto, and are called either altostratus or altocumulus. These clouds appear less distinct than lower clouds because of their height. Alto clouds with sharp edges are warmer because they are composed mainly of water droplets. Cold clouds, composed mainly of ice crystals and usually colder than -30 degrees F, have indistinct edges. Middle clouds usually indicate fair weather, especially if they are rising over time. Lowering middle clouds indicate potential storms, though usually hours away. When altocumulus clouds are scattered and uneven in a blue sky they are called "fair weather" cumulus and suggest arrival of high pressure and clear skies. When altostratus clouds are lowering with winds from the south, they indicate warm front conditions and lowering air pressure, and the approach of rain or snow and a traveling storm system within 12 to 24 hours. • High clouds. These clouds are positioned more than 6,100 meters above ground level. They are cirrus, cirrostratus, and cirrocumulus. These clouds are usually frozen, indicating air temperatures at that elevation below -30 degrees F, with a fibrous structure and blurred outlines. The thin veil of cirrus often covers the sky and partly obscures the sun, or at night produces a ring of light around the moon. Its arrival indicates moisture aloft and the approach of a traveling storm system. Precipitation is often 24 to 36 hours away. As the storm approaches, the cirrus thickens and lowers, becoming altostratus and eventually stratus. Temperatures are warm, humidity rises, and winds become southerly or south easterly. Towering cumulus clouds are the most dangerous of all types and usually never occur when temperatures at the surface are below 32 degrees F.
They indicate extreme instability in the atmosphere. These clouds have bases below 2,000 meters, and tops over 6,100 meters above ground level. When these clouds are mature, they exhibit frozen stratus clouds at their tops that produce an "anvil head" appearance. These clouds may be local storms or they may be associated with the cold front of a traveling storm. They produce high, gusty winds; lightning; heavy showers; and occasionally hail and tornados-though the latter are rare in mountainous terrain. Such thunderstorms are usually short lived and bring clear weather. Cloud caps often form above pinnacles and peaks, and usually indicate higher winds aloft. Cloud caps with a lens shape, similar to a "flying saucer," are called lenticular and indicate very high winds (over 40 knots). Cloud caps should always be watched for changes. If they grow and descend, bad weather can be expected. Serious errors can occur in interpreting the extent of cloud cover, especially when cloud cover must be reported to another location. Sky cover always appears greater on or near the horizon, especially if the sky is covered with cumulus clouds, since the observer is looking more at the sides of the clouds rather than between them. Cloud cover estimates should be restricted to sky areas more than 40 degrees above the horizon-that is, to the local sky. Clouds and precipitation increase with height until a zone of maximum precipitation is reached; above this zone they decrease. They occur near 1,800 meters elevation in middle latitudes and at lower levels as the poles are approached. Usually a dense forest marks the zone of maximum rainfall. • Slopes facing the prevailing wind receive heavier precipitation than those protected from the wind-on the leeward side, especially when large bodies of water lie to the windward side. At night and in fall and winter, valleys are colder and foggier than higher slopes, particularly when surrounding waters like rivers and streams have not yet frozen. REMEMBER! Fog can be used for concealment during movement. • Above 1,500 meters, depending on the region, snow can fall at any time of the year. Excessive snowfall creates avalanche hazards to exposed slopes and can force changes in selected routes. In high mountains, the ridges and passes are seldom calm, however, strong winds in protected valleys are rare. Normally, wind speed increases with altitude since the earth's frictional drag is strongest near the ground. Winds are accelerated when they converge through mountain passes and canyons. Because of these funneling effects, the wind may blast with great force on an exposed mountainside or summit. Usually, the local wind direction is controlled by topography. • Wind blowing at 40 knots pushes four times harder than a wind blowing at 20 knots. When wind strength increases to a hurricane force of 64 knots or more, you should lay on the ground during gusts and continue moving during lulls. If a hurricane-force wind blows where there is sand or snow, dense clouds fill the air. Measure local temperature and wind speed if possible; if not, estimate. Enter the chart at the closest 5 degrees F interval along the top and with appropriate wind speed along the left side. The intersection gives an approximate equivalent chill temperature; the rate at which an object or man cools, under calm conditions, to the ambient temperature (figure 1-2). 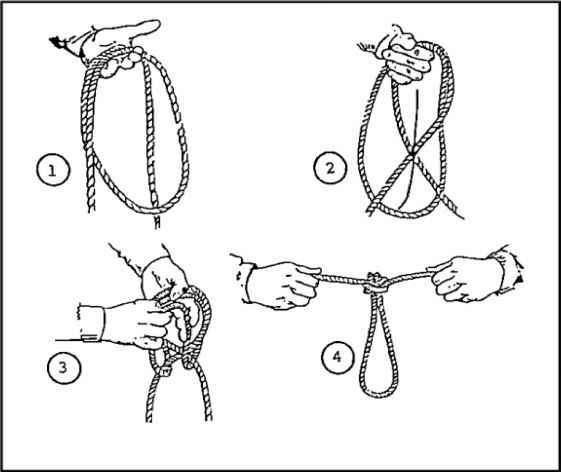 NOTE: This chart was constructed using miles per hour (mph), however, a scale giving the equivalent range in knots has been included on the chart to facilitate its use with either unit. • Wind may be calm but freezing danger is great if a person is exposed in a moving vehicle, under helicopter rotors, in propeller blast, and so on. It is the rate of relative air movement that counts, and the cooling effect is the same whether you are moving though the air or if it is blowing past you. • Effect of wind will be less if a person has even slight protection for exposed parts such as light gloves on hands or a parka hood or balaclava shielding the face. ACTIVITY: Danger is less if the soldier is active. A man produces about 100 watts (341 BTUs) of heat standing still but up to 1,000 watts (3,413 BTUs) in vigorous activity like cross-country skiing. PROPER USE OF CLOTHING and ADEQUATE DIET are both important. COMMON SENSE: There is no substitute for it. 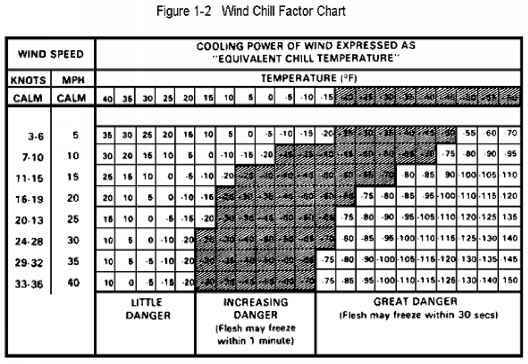 The chart serves only as a guide to the cooling effect of the wind on bare skin when first exposed. General body cooling and many other factors affect the risk of freezing injury. Valley or up-valley breezes develop on during calm, clear days in valleys that are subject to intense solar radiation. Mountain or down-valley breezes develop on clear nights, the mountainsides lose heat rapidly and cool the surrounding air, which settles downslope. Although individual thunderstorms are normally local and are over quickly, they can be part of a large weather system that may hinder mountain operations. In the alpine zone, above the timberline, thunderstorms may be accompanied by freezing precipitation and sudden, squally winds. Ridges and peaks are focal points for concentrated electrical activity, which is dangerous. • Local thunderstorms develop from rising air columns, and occur most often in the middle or late afternoon. Scattered, fair-weather cumulus clouds are harmless, but when they continue to grow large and reach high altitudes of several thousand meters they may turn into thunderstorms. • Thunderstorms that occur at night or in the early morning are associated with major changes in the weather, resulting in stormy weather before clearing on the high summits. Thunderstorms occurring at these times may also be part of a storm line, which is followed by a prolonged period of cool, dry weather. Many casualties have been reported due to lightning during mountain operations, which involve an increased risk of being struck. Lightning kills more people in the United States than any other weather phenomenon. Mountain climbers are often on prominent peaks and exposed ridges, which are subject to lightning strikes and lesser discharges. • The best way to avoid lightning in the mountains is to stay off exposed peaks or ridges, and stay out of an unprotected flat expanse during an electrical storm. If such a storm can be predicted, it is best not to climb. You should avoid being under prominent or isolated trees. If you are caught in an exposed place and have time before the storm reaches you, you should get as far down the mountain and away from the exposed ridges as possible. You should avoid ridges that dominate the skyline-the middle of a ridge is preferred to the end of a ridge. • If lightning strikes seem imminent or are striking nearby, you should seek protection from direct strikes and ground currents. A flat shelf slope, or slightly raised area dominated by a nearby high point gives protection from lightning strikes. If possible, you should stay away from damp or lichen-covered rock. You should tie yourself to a point of protection if a severe shock would cause you to fall. • Lightning kills by passing through the upper torso and the heart, causing cardiac arrest. Keep your hands and upper body elevated away from the ground to help deny electricity a path through the upper body to the heart. To increase the chances for survival if near a strike, you should avoid upper body proximity to the ground and keep objects attached to you away from the ground. On windward slopes, persistent fog, cloudiness, and precipitation often continue for days. They are caused mainly by the local barrier effect of the mountains on prevailing winds. Any cloud bank appears as a fog from within. Fog limits visibility and causes white-out conditions that hamper operations by increasing the chance of accidents. It does, however, aid surprise attacks. When ever traveling without landmarks, it is necessary to use a compass, altimeter, and map to maintain direction. If fog and precipitation occur at the same time, you may need extra clothing for protection against cold and wetness. The most severe conditions, storms with strong winds and heavy precipitation, are due to widespread atmospheric disturbances, which usually travel easterly in the middle and high latitudes. If a traveling storm is encountered in the alpine zone during winter, all the equipment and skills of a military mountaineer are tested against low temperatures, high winds, and blinding snow. • The storms result from the interaction of cold and warm air. The sequence of weather events, with the approach and passing of a traveling storm, depends on the storms development, and whether its path is to the north or south of a given mountain area. Cirrus clouds merge and lower gradually until they become altostratus. Traveling storms do not usually occur in tropic regions. • A storm passing to the north may bring warm temperatures with southerly winds. Precipitation may move in from the northwest, and local cloudiness often obscures frontal passages in the mountains. The storm may go so far to the north that only the cold front phenomenon of heavy clouds, squalls, thundershowers, and cold weather are experienced. The same storm passing to the south would be accompanied by a gradual wind shift from northeasterly to northwesterly, with a steady temperature fall and continuous precipitation. • Rapidly changing weather conditions often create glaze, a coating of ice that forms on exposed objects. Glaze occurs with inversions when light rain or drizzle falls through air below 32 degrees F, and strikes a surface that is also below 32 degrees F, freezing to the surface in the form of glaze, and only persists if colder weather follows. The use of a portable aneroid barometer, thermometer, wind meter, and hygrometer help in making local weather forecasts. Reports from other localities and any weather service, including USAF, USN, or the National Weather Bureau, are also helpful. Use these weather reports in conjunction with the local weather forecast, since weather at various elevations may be quite different due to cloud height, temperature, and barometric pressure differences. Forecasts must reach the small-unit leaders who are expected to make use of weather conditions for assigned missions. • Local storms in the form of thunderstorms, with or without showers. • Traveling storms, which may be accompanied by radical and severe weather changes over a broad area. Usually each type of storm may be identified by the clouds associated with it. • Seasonal moisture-bearing winds (monsoons), which bring bad weather to some mountain ranges and may last for several weeks. Weather predictions are based on educated estimation or on meteorological evidence. Natives of an area may supply weather knowledge that is accurate. An individual remaining in one mountain region for several weeks in any season can add indications for that area based on his own experience. • Changing Weather. This change may be indicated by a marked shift in pressure, wind velocity, or wind direction; an abnormal change in temperature; or in the moisture content of the air within a 12-hour period. A thin veil of cirrus clouds spreads over the sky, thickening and lowering until altostratus clouds are formed. The same trend is shown at night when a halo forms around the moon and then darkens until only the glow of the moon is visible. When there is no moon, cirrus clouds only dim the stars but altostratus clouds completely hide them. Low clouds, which have been persistent on lower slopes, begin to rise at the time upper clouds appear. Various layers of clouds move in at different heights and become abundant. Lens-shaped clouds accompanying strong winds lose their streamlined shape and other cloud types appear in increasing amounts. A change in the direction of the wind is accompanied by a rapid rise in temperature not caused by solar radiation. This may also indicate a warm, damp period. A light green haze is observed shortly after sunrise in mountain regions above the timberline. An increase in size and rapid thickening of scattered cumulus clouds during the afternoon. The approach of a line of large cumulus or cumulonimbus clouds with an advance guard of altocumulus clouds. At night, increasing lightning windward of the prevailing wind gives the same warning. Massive cumulus clouds hanging over a ridge or summit at nighttime or daytime. Plumes of blowing snow from the crests of ridges and peaks or ragged shreds of cloud moving rapidly. Persistent lens-shaped clouds; or a band of clouds over high peaks and ridges, or downwind from them. A turbulent and ragged banner cloud that hangs to the lee of a peak. A cloudless sky and shallow fog, or layers of smoke or haze at valley bottoms in early morning. A cloudless sky that is blue down to the horizon or down to where a level haze layer forms a secondary horizon. Conditions under which small cumulus clouds appearing in the forenoon do not increase but decrease or vanish during the day. Clear skies except for a low cloud deck that does not rise or thicken during the day. A gradual lowering of the clouds. This may be the arrival or formation of a new lower strata of clouds. It can also indicate the formation of a thunderhead. An increasing halo around the sun or moon. An increase in humidity and temperature. Cirrus (mares tails) clouds. A decrease in barometric pressure (registered as a gain in elevation on an altimeter). A gradual rising and diminishing of the clouds. A decreasing halo around the sun or moon. Dew on the ground in the morning. Small snowflakes, ice crystals, or drizzle, which indicate that the clouds are thin and fair weather may exist at higher altitudes. An increase in barometric pressure (registered as a loss in elevation on an altimeter). Small snowflakes or ice crystals indicate that the clouds above are thin, and fair weather exists at high altitudes. A steady fall of snowflakes or raindrops indicate that the precipitation has begun at high levels, and bad weather is likely to be encountered on ridges and peaks.